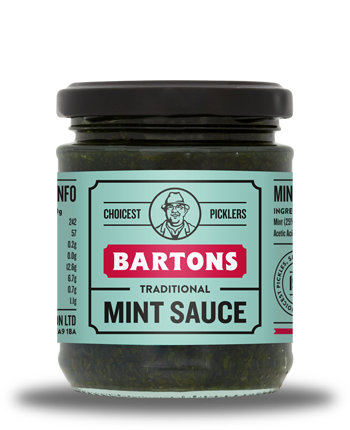 Bartons Mint sauce is a sauce traditionally made from finely chopped dried mint leaves, soaked in vinegar and sugar. Bartons Mint sauce is a sauce traditionally made from finely chopped dried mint leaves, soaked in vinegar and sugar. The sauce is thick and should have the consistency of yogurt. It is traditionally used as a complement to roast lamb or other lamb dishes. Mint sauce can also be used in some recipes in place of fresh mint. It can be eaten on toast or bread and can be added to yogurt to make a mint raitia or salad dip. Did you know that Mint Sauce has been eaten since Medieval times in Europe, especially England but is also used in French and Italian cuisine. For those who need more than a jar, we also have catering sizes. Dried Mint – Spearmint 25%, water, barley malt vinegar, sugar, acetic acid, salt.